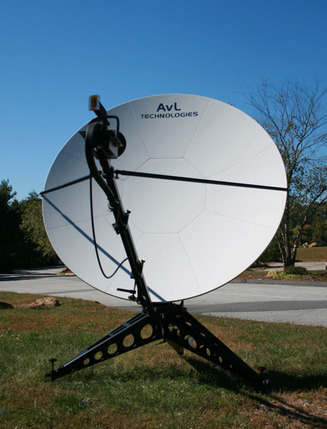 AvL’s 2.4m Manual FlyAway Antenna System is robust with a 9-piece carbon fiber reflector yet compact enough to transport in four cases. The antenna weighs 240 lbs assembled, and the triopd legs can be ahchored to increase wind resistance. The carbon fiber reflector and tripod base are rugged enough for operations in harsh conditions and the Az/El positioners enable easy pointing and fine tuning. The antenna assembles in 15 minutes.